I’ve had a lengthy unrequited love of Jack-in-the-Pulpits. In my first “experimental” garden years, I brought home odd collections of floppy cottage-y flowers A single delphinium here, a black-eyed-susan there, two shades of pink lavatera side by side. The day I first I cracked open Ken Druse’s book The Collector’s Garden I instantly identified with the gardeners with their devotion to quirky plant fetishes and never looked at gardening the same. His description of his own love of Arisaemas has always been a placeholder in my mind, as a plant that grown-up, sophisticated gardeners might grow. Except for a single failed attempt in a spot the dogs love to promptly destroy, I’ve been too intimidated by the small pots of pricey plants to give them a go. Whenever I come across them, I always stop to admire them and let them tug at my heartstrings. 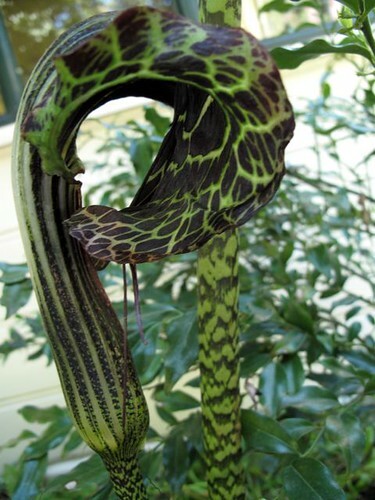 I like them all, but ever since I came across a jaw dropping monster sized Jack-in-the-Pulpit at a garden party, it’s been my mission to find it. 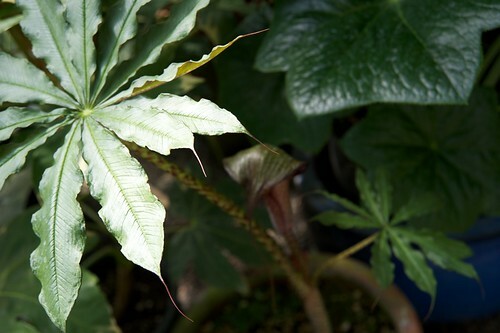 It stood at about 4 feet tall, with heavily veined leaves around a foot across, and intensely spotted stems. This was my lucky weekend at the HPSO sale. 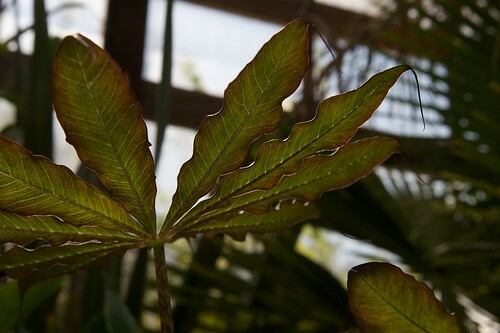 I got the two that I knew the identity of, plus, I think I found the mystery plant – Arisaema speciosum ‘Magnificum.’ The sign called it the largest of the Arisaema. The tag says it gets 30″ but the guy working the table said 6 feet. 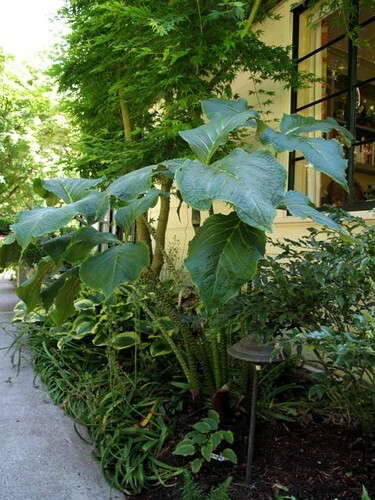 I bet 6 feet was a bit optimistic, but I think I might have found my dream big plant. I got home and excitedly told Justin how big this one gets, and he gave it the nickname. I’ve never named a plant before, but I think this one’s going to go as Shaq. And for good measure, I got one more, Arisaema utile. 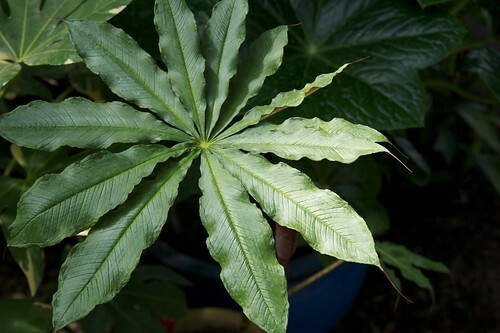 It has a silly description on the plant tag. “One of the prettier in the genus…” Of course the prettiest in the genus is whatever one you happen to be currently looking at. 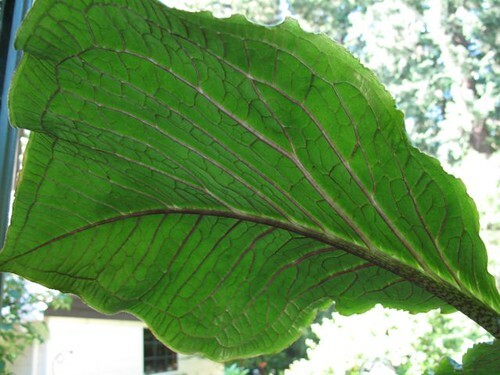 It hasn’t leafed out yet, but the others at the sale that did have leaves produced large, deeply textured leaves. When I was carrying it around in my plant sale box, a woman walked by and remarked to her friend, “that’s obscene.” Hey, jack-in-the-pulpits have feelings too! 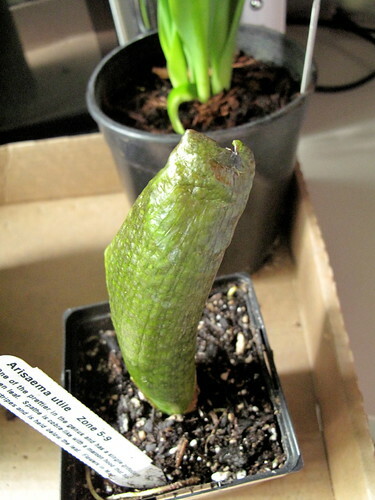 If I manage to successfully grow four different Arisaemas, does that mean I’m finally a grown-up gardener? < Q: What’s even better than plant shopping at Cistus? You will become attached to your new babies. Arisaema Speciosum is on my list of purchase among others. I started with Arisaema Triphyllum our native species and then followed by the Asian Species, now I can’t seem to stop dreaming about them and acquiring them all. Your name of this post is really cute. These are sure some quirky plants. I’m hoping one will show up in my garden but so far no takers. Darn! Still a juvenile gardener here. 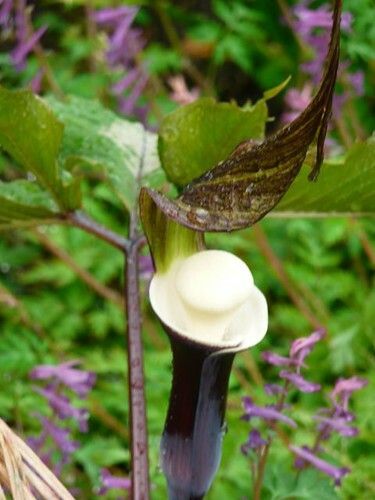 I’ve been too intimidated to try Arisaema though I’ve heard of one or two that might do OK here. Probably nothing like Shaq though. Good luck with the big, obscene fella. 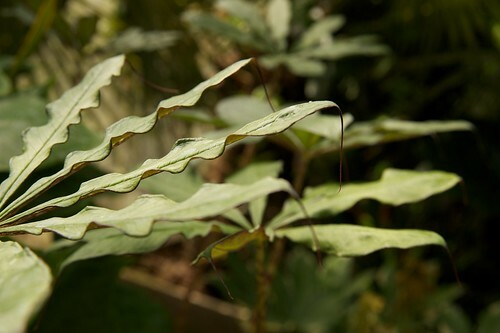 Great photos of the Arisaema taiwanense. I think naming a plant is a sure sign of a grown-up gardener (ha). Congrats on your finds…I can’t wait to see the 6ft Shaq in the garden. I love it, Shaq! May it grow big and tall and dominate the garden with its show-offy grandeur. I am still in the juvenile phase, even though I admire your (and Druse’s) collector abilities. I see plants like that and go, “ohh, ahhh” and then get scared off by price tags and growth requirements that I doubt I could provide. I figure they should go to better homes. I can’t wait to see where you plant yours, and how they thrive. Anyone at a plant sale who makes a rude comment about something you’ve already chosen deserves a bit of dirt in the eye. Rude! Loose lips at the Hardy Plant Sale? I thought all gardeners were soft spoken, gentile sorts, but you and Loree both overheard rude comments. The last time I visited Leach Botanical Gardens, there was a wonderful stand of Cobra Lilies that stopped me in my tracks. Good for you…going for the gusto! Keep us posted, won’t you? What is up with the commenters at that sale? First rude remarks to Loree and now this… Geez people, take a chill pill already. Better yet, take cues from your hubby. Shaq is a as apropos as I can imagine. Great finds, Megan. You rock…. and inspire.